Emma D. Serafin is from the Malaybalay in Bukidnon Province in the Philippines. 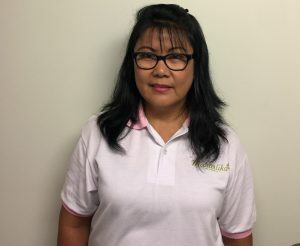 She has 10 years of cleaning experience and is a founding member of Maharlika Cleaning Cooperative: Emma joined to make her life more worthy and to earn more money. In addition to being a member of Maharlika, Emma is the President of Bukidnon Kaamulan in America, Inc., a non-profit organization that helps needy school children and college scholars in Bukidnon. Emma loves to be with friends, and has a passion for listening to music, dancing and adding numbers. She looks forward to making use of her talents and skills in every way. Jean Llanto, from the Philippines, joined Maharlika Cleaning Cooperative to learn how to build a collective and cooperative business. 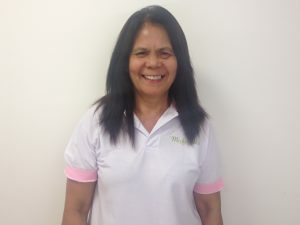 Jean loves cleaning the four offices where she currently works, and she hopes the cooperative can have more clients in the future to be successful for the members and the Filipino migrant community. Jean is a former board member of Damayan Migrant Workers Association, and has been trained in meeting facilitation and occupational safety. She is a mother of a five year old boy who is in kindergarten in the Philippines. Celevic Sawit, from Las Pines in Manila, joined Maharlika Cleaning Cooperative because she sees the Coop as an opportunity to be elevated in this country. Celevic is proud to be a housekeeper in the US, and formerly a medical doctor serving in the veterans hospital in the Philippines. She enjoys reading and listening to music, and her great hope is that her family stays happy. Alicia Nadura is from Aklan, Philippines. She joined Maharlika Cleaning Cooperative to be part of a group of Filipino women and to have stable work as a worker-owner. Her goal for the Cooperative is to grow and be successful. 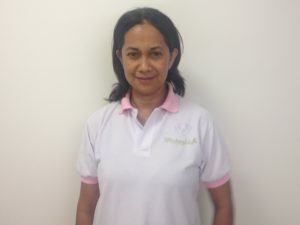 Alicia’s skills include being honest, patient and hardworking, including as a cleaner. She enjoys listening to music and playing and reading books with her grandson. Annie Bello, from the Central Luzon area of the Philippines, has been living in the US since 2002. She arrived from Singapore where she worked as a domestic worker from 1993 to 2002, where cleaning was a major part of her job. Annie has taken trainings in infant, child and elder care. 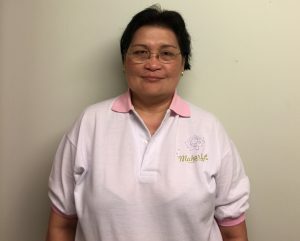 In the United States, Annie has worked as a pharmacy technician, phlebotomy and ECG medical technician, a nanny and a cook, and a former board member of Damayan Migrant Workers Association. She is dedicated to doing community work such as leading bible study in her church, visiting nursing homes, helping at a food pantry, and being part of a women’s fellowship group. 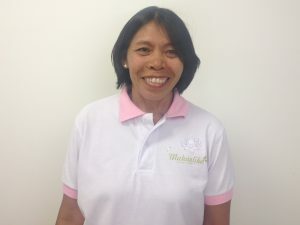 Annie is excited to help Maharlika Cleaning Cooperative be a successful business through harmony and hard work, and reliable, eco-friendly cleaning services. 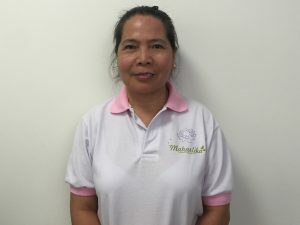 Guada Omaguing, from Dumaguete, Philippines, is proud to join Maharlika Cleaning Cooperative to gain more experience and provide a better future for her family, including her two sons and loving husband. Guada has twenty-four years of cleaning experience, largely gained through her work at the Consulate of Morocco and for a diplomat employer. Guada is grateful for having found Damayan Migrant Workers Association and for the opportunity to join the Cooperative. Rina Hernandez, from the Philippines, is a mother of two daughters who are both now working in the Middle East. In the Philippines, Rina was a teacher at both the high school and college level. Rina then pursued her goal of coming to work in the United States. She is excited to be part of Maharlika Cleaning Cooperative, as it helps her explore more about herself, deal with people, and create good partnerships. Rina appreciates how in the cooperative people help each other, share ideas, and pursue trainings that make the coop the best it can be.